Mac Suibhne- anglicised as MacSween(e)y, McSween(e)y, Swee(e)ny, MacSween, with up to 30 earlier variants, such as McSwiny, M'Sweeny & c. The root word is personal name Suibhne, which Woulfe states means 'well-going', q.v. 'Sloinnte Gaedheal is Gall', 1923. There is also a Norse personal name Sveinn, meaning 'boy' or 'servant'. Since the MacSweeneys were likely of mixed Gaelic-Norse descent, as many Galloglas (Scottish mercenaries) were, this may well be relevant. The Galloglaigh or Gallowglass foot soldiers were fierce, heavily armed fighting men, normally emanating from the Scottish Islands and Highlands. Of such were the MacDonnells/MacDonalds. The MacSweeneys, probably crossing over from Argyle, arrived in Co Donegal in the 14th century, according to most authorities, where they were hired by chiefs such as the O Donnell. However, they may well have been involved in Ireland before that date as Murrough MacSweeney's death (hardly a natural one) is recorded in the Annals of Connacht in 1267: 'Murchad MacSuibne was captured in the Owles by Domnall son of Magnus O Conchobair, and delivered up to Walter Burke, Earl of Ulster. He afterwards died in the Earl's prison'. 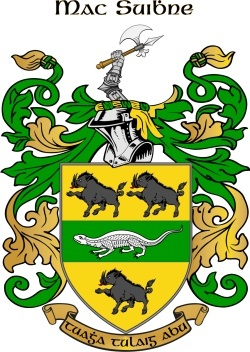 MacFirbis' 'Genealogies' actually claims their descent from one Donnsléibe Ó Néill, who was a chieftain in Argyle, and whose son Suibne was the eponymous ancestor of the clan. This O Neill may or may not have been of the 'race' of the Ulster O Neills. At any rate MacSweeneys had, by the middle of the 14th century, set up septs on the Irish model in Tyrconnel, Co Donegal. The three branches were known as Mac Suibhne Fánaid, Mac Suibhne Báinigh and Mac Suibhne na dTuath. The first of these held Rathmullen Castle, and their kin spread into Kilmacrenan Barony. Banagh is the name of the barony, which includes the most westerly part of the Donegal coast, and MacSwines Bay. The last were lords of Tuathe Toraighe, including Tory Island. It was a scion of the first mentioned above that migrated to Muscraighe (Muskerry) in Co Cork in the early 1500s, where they soldiered for the MacCarthys. In Cork they held several castles, and were apparently famed for their hospitality. Capt Bryan MacSweeney, commander of Kilbrittane Castle, South Cork, is named as a commander of rebel militia in the 1641 'Depositions', and accused of ordering the murder, or turning a blind eye to the murder of English Protestants. Boylagh & Banagh (all specified here are baronies, unless otherwise stated), MacSwyne 7 (figures are for families); KillmacCrennan, MacSwyne 39. Mayo is missing from the 'Census'. City & Liberties, MacSwyny 8; Kinalmeaky, Moylemorry MacSweeny is named as a 'titulado' or land holder in Mullagh civil parish. Eligurty & Ikerrin, Swyny 8. Griffith's 'Primary Valuation' of Irish households in the 1850s has the following: Sweeny, Total No 1879, highest in counties Cork 544, Donegal 321, Mayo 204, Kerry 96 and Tipperary 89. Sweeney, Total 640, highest in counties Donegal 145, Cork 145, Kerry 48. McSweeny, Total 119, mostly Cork and Kerry; McSwiney, 33, 25 of which in Cork city. The 1890 births distribution figures (Matheson, 'Special Report...' 1894) show most Sween(e)y births occurring in counties Cork, Donegal, Mayo and Kerry. Totals: Sweeney 166; Sweeny 82. McSweeney had 29 occurrences, mostly in Co Cork. Terence MacSwiney (1877-1920) the lord mayor of Cork whose 70 day hunger strike sent reverberations around the world. His death as a martyr for Irish independence perhaps sounded the death knell of British rule in all Ireland. Thomas William Sweeney (1820-1892) born in Cork, went to the U.S. where he enlisted as a soldier; he finished up as a brigadier general. In the Civil War he gained notoriety by answering the call to surrender the arsenal at St Louis (to Confederate forces) that he would rather blow it up. His strong character showed up again in his agreeing to lead the Fenian raid into Canada in 1866. Leave a message for SWEENEY family members. Hello, Im looking for information on my Sweeney ancestors. James Sweeney, born about 1816 in County Derry and his wife, Mary McBride, born about 1821 also in County Derry are my 3rd greatgrandparents who emigrated to Saint John, New Brunswick, Canada sometime around 1850. I believe James was a labourer and I believe he and Mary may have had two daughters born in Ireland, Rosa, born around 1848 and Mary, birth date unknown. Any information would be greatly appreciated. Hi, Im trying to trace my ancestors who I believe came from Roscommon Castlereagh. My Great Grandfather Hugh Sweeny was born in Ireland approx 1802. He moved to Liverpool Bootle and met his wife Mary Anne Dagnall I believe. They married approx 1843 and lived in Princes Terrace, Bootle 1851 Census. Their 1st son Henry my Grandfather was born 1846 in Ireland! Hugh their 2nd son was born in Liverpool 1848. Their daughter Mary Anne, was also born in Liverpool 1850. This I have found on 1851 UK census. There was some some talk that the family moved to either Australia or America. Invite more SWEENEY family members! Click 'Invite' to connect with more members of the SWEENEY tribe.